Commencement Menu Show search box. 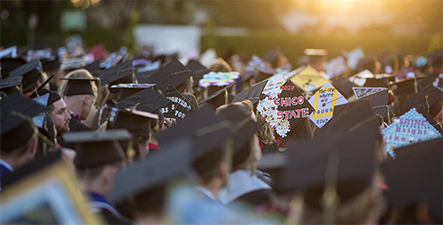 Third St. & Chestnut St.
Use #Chico2019 and share your Commencement experience! On behalf of the faculty, staff, and administration of California State University, Chico, we would like to invite you to join in the celebration of Commencement to be held on Friday, Saturday, and Sunday, May 17-19, 2019. The Commencement ceremonies are designed especially for you, your family, and friends to celebrate this momentous event in your lives. We are sure you are proud of your accomplishments. We at the University are proud of you as well. February 15: Last day to apply for graduation in order to have your name listed in the Commencement program and on the back of the Grad T-Shirt. March 6 & 7: Gradfest in the BMU 008, 10 a.m. - 4 p.m. Get all your Commencement questions answered. Register for the ceremonies and rent your cap and gown. March 6-31: Rent your cap and gown online here. March 6-April 30: Register online to participate in the Commencement ceremonies here. April 3-April 30: Request your tickets for the Commencement ceremonies here. The College of Behavioral and Social Sciences can request up to six tickets per graduate. All other colleges can request up to seven tickets per graduate. These numbers are determined by stadium occupancy. April 30: Senior Send-Off in Trinity Commons, 11 a.m.. - 1 p.m. Free food and prizes for graduating seniors. Contact the Alumni Office for more information: 530-898-6472. College of Behavioral and Social Sciences May 2 at 9 a.m.
May 2 at 2 p.m.
May 3 at 9 a.m.
College of Communication and Education May 3 at 2 p.m.
May 6-19: Pick up pre-ordered cap and gown in BMU 008, 9 a.m.. - 5 p.m.
May 9-19: If you did not pre-order your cap and gown online, you may rent it now in BMU 008. 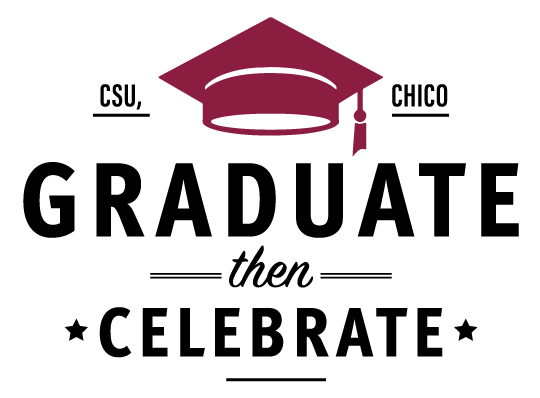 For information on applying for graduation, you will need to follow the directions on the Graduation Advising website. Contact the Office of Graduation Advising at 530-898-5957 with any questions.